$159.0 Tripp-Lite B020-008-17 1U 17" LCD Rack Monitor 8 Port Console KVM Switch!!!!! $1.25 (2 bids) KVM Console to USB 2.0 Portable Laptop Crash Cart Adapter - WOW DEAL!!! Buy: $174.99 Industrial Rack Mount Monitor KVM Switch RMD-515 15.1" Screen 19" Rack Mount! $59.95 APC AP5015 15" 1U Rack Mount LCD Monitor w/ cables. Buy: $30.0 Advocent KVM 4 Port SwitchView USB 520-337-001 with AC Adapter FAST FREE SHIP! $25.0 TRENDnet 2-Port USB KVM Switch Kit with Audio Model TK-209K White NEW! 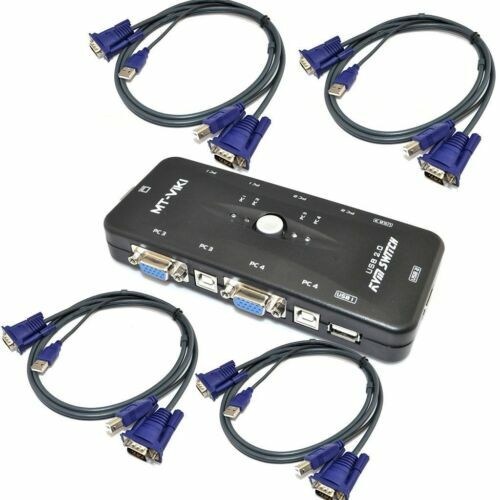 $17.81 Mailiya USB Switch Selector, KVM Switch 2 Computers Sharing 7 USB Devices USB 2.